This is a fairly simple project that doesn't require many supplies. Learn how to make letter wreaths that you can hang in your window this holiday season after the jump. Take your garland and form the letter you want to make. Depending on the length of your garland you may have to double fold to maintain even thickness. 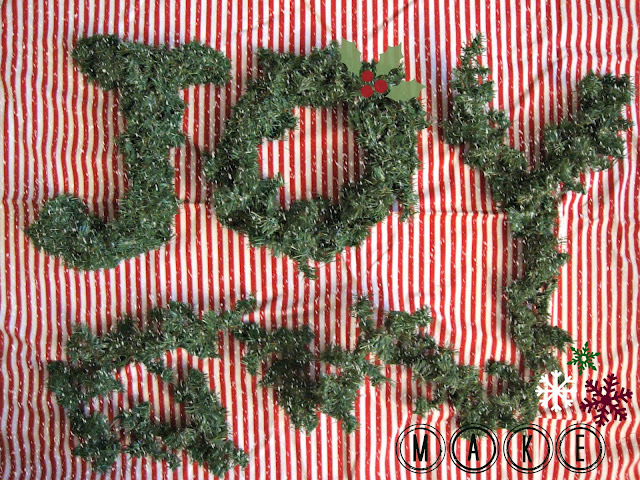 As you form your letter, squeeze and twist pieces of the garland to each other. The wire in the garland should provide enough holding power. Just make sure you're interconnecting pieces to each other and squeezing tightly. It's kind of like molding play dough but really scratchy, though play dough. Match your letter sizes to keep them proportionate. At this point you can attach your string to suspend your letters, making sure your letters hang balanced. Hang on suction hooks. You can also string battery operated lights into these as an extra step, hiding the battery pack behind the letter. I'll show you how I did this when I get a chance to take pictures of it in the window.